Inside: Check out these money saving tips for bathroom items you normally buy. Ever worry about waste in the bathroom? Er….wonder how you can save money on all that stuff you keep in the bathroom? Living frugally, or just plain not wasting money, involves saving money in all areas. Yep, bathroom included. Check out these ten tips on how to save money in the bathroom. Have you been buying your bathroom supplies at the grocery store? If so, there is a good chance you are paying too much. Check other stores like your local drug store or places like Target, Walmart, or Costco. On some items, I can even find great deals on Amazon. For many things, you may be set on a particular brand. Sometimes, though, it does pay off to try something new (and less expensive). Things like cotton swabs, cotton balls, tissues and soap you may find that the store brand or a less expensive one works well. Even toilet paper. Yep. I’m not saying to go and start buying the single ply stuff that feels like sandpaper. But do try less expensive brands if you haven’t already. We’ve found the store brand at most stores is pretty nice. Feeling skittish about trying the store brand? Buy just a small package of it to try it out before getting the 12-pack or family-size container. From our own experiences, about 85% of the time a cheaper brand works as well or better than its pricier counterpart. There really isn’t a need for expensive, chemical-smelling cleaners for the bathroom. Between Dr. Bronner’s, Bon Ami, vinegar, baking soda and some glass cleaner, we have affordable and effective cleaners that don’t make me feel the need to wear a gas mask. Do you use liquid soap? If so, stop buying new containers whenever you run out and instead get a large container of soap refill. You’ll not only save money, but you’ll cut down on plastic waste. I will also argue that unless you normally buy froufrou bar soap, making your own soap is unlikely to save you money. And there is also the time involved. Waiting for a good sale and buying a basic moisturizing soap from the store will save you more money without the huge time investment. There are a few different ways you can save money on toilet paper. One is to go ahead and buy the bulk packages because at least you know the toilet paper will actually get used. To do a good price comparison, you need to look at total square feet and use that to compare prices. One brand may have 300 s.f. per roll and another has 478 s.f. So, go ahead and dig out that calculator app and figure out which brand will give you more for your money. As mentioned before, don’t be scared of the store brand. We store our nail stuff in the bathroom, so it counts, right? Rather than paying for a manicure or pedicure, get the supplies to do it yourself. For less than the price of a mani/pedi, you’ll have supplies plus polish to get you started. If you have the room, stocking up on the basics when they are on sale is a good way to save money on bathroom supplies. Just today I got a bulk pack of our usual soap for less than $1 a bar thanks to a sale. Despite what all the advertisements say, most shampoos are equally effective at cleaning. Your $5 clarifying shampoo will likely work as well as a $25 one, and a $4 moisturizing shampoo will do just as well as one from your hairstylist. I’ve gone to get my hair cut and the stylist will comment on how healthy my hair is and wonder what shampoo I use. It’s a $5 family size container from the drugstore, plus I let my hair air dry. It’s clean, soft, and no split ends. Some things, like dandruff shampoos, you may find you need to pay a bit more for a different active ingredient. But most dandruff shampoos use similar active ingredients so the $10/bottle name brand may have the same primary ingredient as the $4 store brand. Looking for an easy way to save money on water? Check your showerhead. Even if you are renting, you should be able to switch out an older showerhead for a good, low-flow one. You can still get a good, strong stream of water from them! As a bonus, you’ll not only save on water, but you will save on the cost of heating all that excess water you were using previously, as well. For the faucet, if it isn’t already low flow, check for an aerator on it. It will be something at the end of the faucet you can unscrew with your hand. If you take that bit with you to the hardware store (for sizing), you can replace it with a low flow aerator that will restrict the flow of water to about 1.0 GPM. The aerator basically allows air to mix in with the water to create a water stream that is still strong, but uses less water. Yep, I’m on a water kick again. No, I’m not super-strict about our water use, but I do dislike paying hefty water bills. So, this is another easy win. If you don’t already have a low flow toilet, then try filling a plastic water bottle (or empty 20 oz bottle) with water and put it in the tank. That will displace enough water to trick the toilet tank into using less water on each flush. Living frugally means spending wisely. By watching for sales, trying store brands, buying some items in bulk, and watching water usage, you can save money on most products you use without compromising your cleanliness. 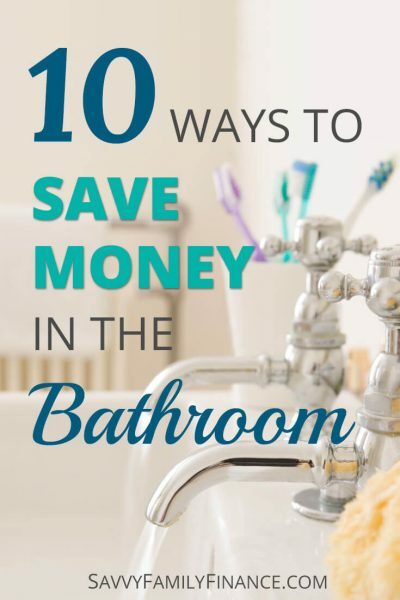 What ways have you found to save money in the bathroom?